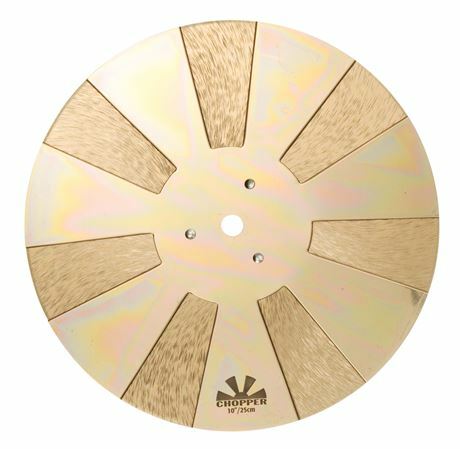 Shop Sabian 10 Inch Chopper Multi Surface Sound Effect from AMS with 0% Interest Payment Plans and Free Shipping. The Chopper is an innovative 3-layer design that delivers a super-fast white-noise responses. The Chopper is a great effect for playing rhythms and accents in drum and percussion set-ups plus it easily fits on a cymbal stand. A Chopper can also add a distinctly different flavor when used in place of an X-hat, or laid on a snare drum to create a funky techno-type slap. Already the choice of Mike Portnoy, Will Calhoun, and Rodney Howard, the Chopper fits comfortably on stands in any drum or percussion set-up.